Home » Ye Ol’ Blog » Chuck Lee Customers » It’s all about the great customers. 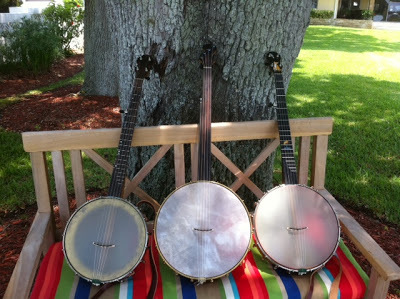 Wow, we love our banjo customers. 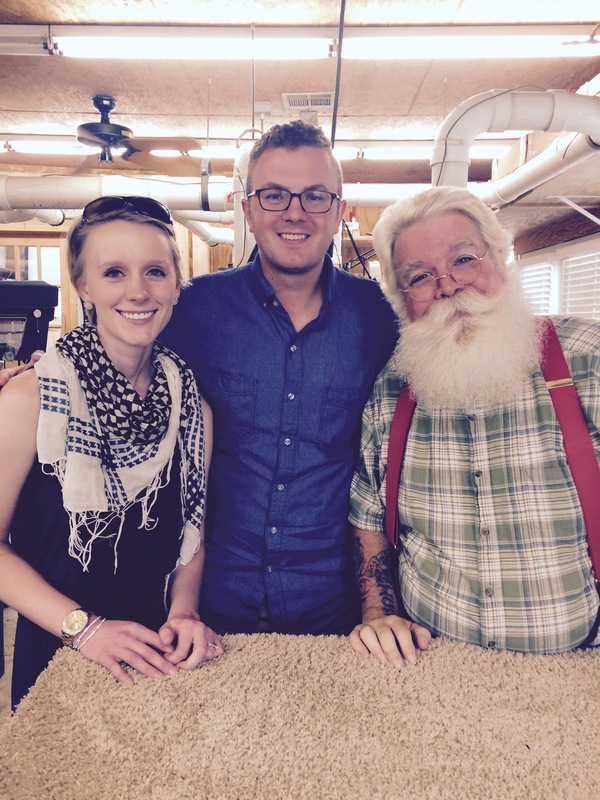 The following was written by Devin Tower, who we have had the pleasure of getting to know as a Texan, a customer and a banjo player. He’s just another example of what this business is all about–the end user! “About 5 years ago I was fortunate enough to retire at an early age. Many friends asked me what I would do and I told them ‘I used to play the banjo and wanted to do it again’. 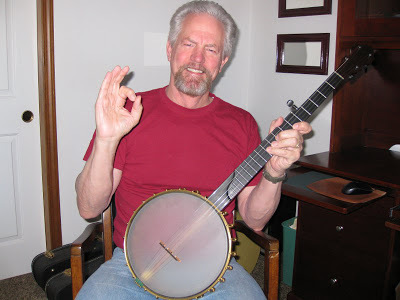 So I started practicing bluegrass three finger style and it came back to me. Then one day I heard Mary Cox playing clawhammer style and loved her sound on her Chuck Lee. I started playing some clawhammer and it came pretty natural. So eventually after a lot of research …. I looked up Chuck and the next thing you know I was in his shop In Texas. I had quite a few bluegrass style banjos but my wife told me I could have another banjo if it had our cat inlaid on it (not really! well, sort of!). 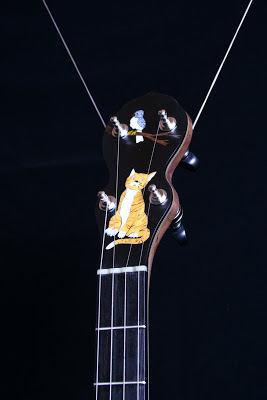 Anyway, I showed Chuck pictures of “Billie the Cat” and we decided to build the Cat banjo.. it has Billie on the headstock longing for a bird and her fishing on the fingerboard…the inlay is a work of art but the inlay is the least of it. Its about the SOUND and the QUALITY! Chuck’s instruments are world class. The tone is special . The workmanship is impeccable. All the care and love Chuck has for what he does is embodied into the instrument. This Cat banjo has a beautiful curly maple 12 inch pot with a wooden tone ring and a highly figured black walnut neck…and a wonderful tone. 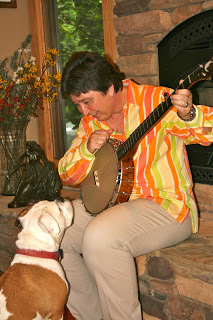 So the story goes on… I was in Chuck’s shop again after getting the Cat banjo and I played a banjo he was shipping out. It had an 11 inch rim and Chuck’s Dobson style tone ring .WOW! Another great sounding instrument. So once again Chuck and I picked out the wood. Curly maple neck. 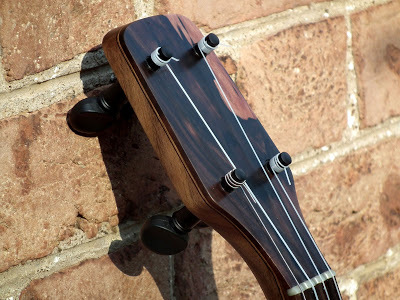 curly maple rim, figured ebony fingerboard and with no inlays. You see its all about the SOUND. Another Chuck Lee masterpiece was soon in my hands. What a joy to play. The most recent banjo Chuck built for me is a 13 inch pot, nylgut stringed, scrolled headstock banjo with a skin head. We call it the “Fretless Wonder”. It’s like an old southern gentleman with a low soft but clear voice. A beautiful voice that is wonderful but hard to describe. Next post I couldn’t be happier with my Chuck Lee experience.